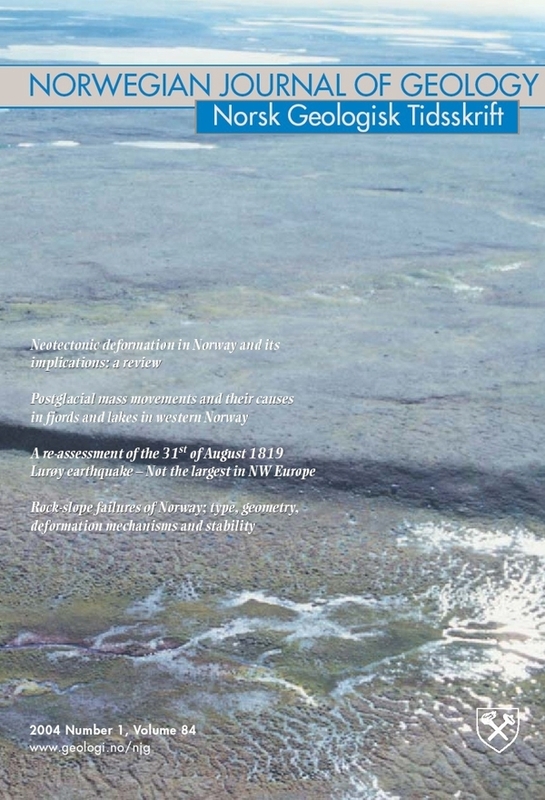 Reports of neotectonic deformation in Norway, including Svalbard and offshore areas, have been graded into five classes depending on the quality of documentation and their most likely origin. A large number of the mainland locations have been visited and careful field investigations carried out, while offshore localities have been analysed by 2D and 3D seismic and multibeam data. After a critical evaluation of the 79 neotectonic claims in Norway as a whole, we have classified three of these as ‘A - Almost certainly neotectonics’ and another seven as ‘B - Probably neotectonics.’ The majority of the reports are attributed to effects other than tectonic. The present grade A claims include two postglacial faults in northern Norway and one postglacial fault in southern Norway. The NE-SW oriented, reverse Stuoragurra Fault in western Finnmark constitutes the Norwegian part of the postglacial Lapland Fault Province. The NW-SE striking Nordmannvikdalen fault in northern Troms is a normal fault trending perpendicular to the extensive system of NE-SW trending reverse faults in northern Fennoscandia. The grade B claims include supposed secondary effects of large-magnitude earthquakes such as abundant liquefaction structures, rock-slope failures and other collapse structures in northern and western Norway. There are indications that three separate, large-magnitude earthquakes affected the Finnmark-Troms region during the period 11,000-9,000 BP. Palaeoseismic events have also been postulated in western Norway. There is, for example, evidence of three regional slide events in western Norway, including one episode shortly after the deglaciation and two events at c. 8,000 and c. 2,000 calendar years BP. The 8,000 y. BP event has been interpreted as the effect of a tsunami generated by the Storegga slide while another 8,000 y. BP liquefaction event, in Nord-Trøndelag, may also be related to an earthquake. The offshore investigations have not confirmed any firm evidence of neotectonic deformation events, although several distortions in Quaternary reflectors have been mapped in the northern North Sea area, where subtle features may represent faults associated with gas leakage. A major seismic pulse most likely accompanied each of the deglaciations following the multiple glaciation cycles in mainland Fennoscandia and Scotland during the last 600,000 years. The interaction of the contraction and dilation of fissures associated with these glaciation cycles may have facilitated fluid and gas leakage through the reservoir seals and gas chimneys, ultimately forming pockmarks on the sea floor. This mechanism could also have contributed to the concentration and pumping of hydrocarbons from their source rocks to reservoir formations. A possible example of this mechanism is shown by a recent earthquake along the postglacial Stuoragurra Fault, which has significantly influenced the groundwater circulation. Our understanding of past and future tectonic activity is especially important for the evaluation of hazard risk related to rock-slope stability.